Last weekend was the PATH conference in Bozeman, Montana. Dad, mom and I drove over on Thursday to be there Friday morning to set up my exhibitor table. 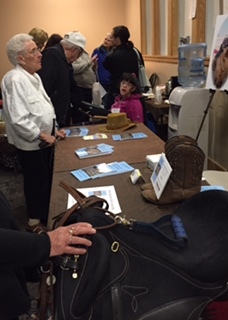 I had my saddle and reins as part of the display, along with my picture of Chester and I. We had a great time at Eagle Mount Recreation Center. What an incredible place! In addition to having a stable for 15 horses and heated riding arena, they have a huge therapy pool. It was so exciting to be one of the speakers at the conference, sharing some of my life and reading my book. 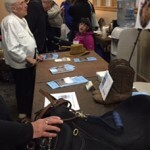 I even sold some of my books, and met some inspirational people from as far away as Colorado and Anchorage, Alaska, all who have a love for horses and therapeutic riding. I might even attend the conference next year in Ellensburg, as I was the big winner of the drawing for free attendance next year! Thanks for this picture…both photo and description…of your wonderful time in Bozeman. So happy I was able to attend! I have watched the video I took of your presentation. It captured most of it except the question and answer portion at the end because I ran out of “storage!” I will make sure Bethany shows it to you next time you meet! Congratulations on this, your first presentation out of town! I believe there will be more and I am still determined to find the video I took at your launch party, so maybe you can share that in the future! I will go onto your website and change my email address to my home so I an still get your posts!